I use a @now tag as a bookmark to the task I am working on. Here is a script to remove the friction of manually typing and deleting a @now or @next tag of this kind. 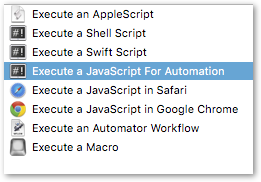 It can be attached to a keystroke with something like Keyboard Maestro or FastScripts. If there is already a @now tag somewhere, it just moves it on to the next task that is not @done, unfolding part of the outline to make the newly tagged line visible, if necessary. or to the immediate parent. If you are using TextBar to display the line marked with @now, you can also trying editing the 3rd argument to the main function (right at the end of the script) to 1 rather than 0. This will force TextBar to update its display of your current task each time this script moves your @now or @next tag. // descendant tasks not @done ? The code in the previous post is now updated for (and requires) TP3 Preview version 166.
hmm, all it is doing for me is moving the @now tag down to next task. also does it ignore projects and notes, only tagging tasks? does it ignore projects and notes, only tagging tasks? If you would like to force an update to the TaskBar display (in advance of the refresh interval), you can edit the last line of the script to change the final zero to a one. (i.e. giving blnTextBar a non zero value). Is there any behaviour that you had in mind, or would like to see ? 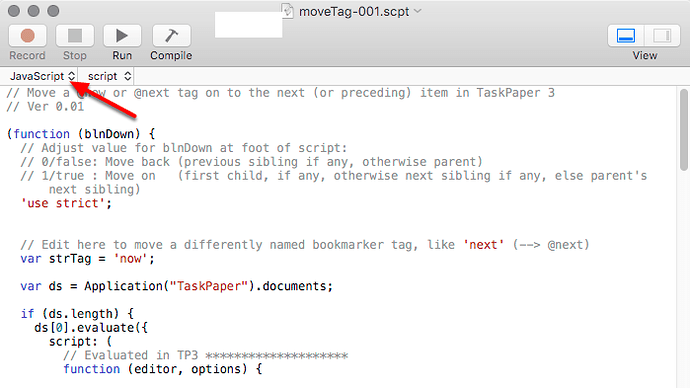 (The goal of the script is simply to streamline moving from one task to another, without having to manually delete and move/type the bookmark tag. One option that could be simply added to it would be flagging a task as @done – possibly with a timestamp – before moving the @now tag on to the next task). Updated (in original post) to version 6. Adds a fourth parameter, blnMarkDone, to the end of the script. The current item will be time-stamped as @done(yyyy-mm-dd hh:mm) before the @now or @next tag moves on. If completion of that task finishes off a whole project, that project will also be marked ‘@done’, with a time-stamp. // then it can't be tagged. This script was written during the TaskPaper 3 Beta, before the final scripting interface was adopted. // will trigger an immediate refresh of the TextBar display.